Loneliness and Facebook: Learning to Change Our Social Media Behavior What is Mohs Surgery? Integrative Medicine is empowering the community to take back their health. Everyday people are realizing its potential: natural dietary supplements can help ward off disease, acupuncture and yoga can strengthen our immune system – the list is endless. Integrative medicine represents a promising marriage between modern and traditional medicine – this new healthcare paradigm is poised to make great impacts on the vitality of our communities. At FoundHealth, we believe in the power of Integrative Medicine, a field invented by Dr. Andrew Weil. Our goal is to maximize health by presenting a variety of treatment approaches to facilitate healing for patients. We are committed to validating Dr. Weil’s prediction that Integrative Medicine would soon lose the ‘integrative,’ because it will become the standard of healthcare. The following infographic tells the story of this burgeoning industry. Thanks to pharmas.co.uk for developing the infographic. We must really push for this. Fed up with traditional medicine and health practices. I am very interested because I feel it touches on everything. Integrative medicine is the key to wellness. I pray that this will end the “That’s not my body part specialty” field of medical practice. Having a medical background myself, I fully believe that modern medicine is complimented by traditional medicine and vise versa. I also believe that the FDA is holding back the use of traditional medicines, do to the big money that the pharmecutical companies throw around… We as a nation would benefit greatly by just eating more fruits and vegetables and also by juicing those same fruits and vegetables more often… I’ll get off my soap box now .. have a awesome day!! Great insights here, and people should approach their health in a pro active way eating natural and clean foods. Always treat your ailments with the mildest natural solutions first,at least give them a try. As a Nutritionist, I have seen the positive results first hand. That is so great to hear! We’d love for you to explore the website & share your experiences with different treatments as a nutritionist! Food is the most powerful medicine! Thank you, I may cancel my Kaiser and just come to you…..
Haha! I’m glad you enjoyed it. FoundHealth believes that Integrative Medicine should play an essential role in creating a personalized care plan, but Kaiser is still essential!! Thank you Darrrell. It is refreshing to hear anyone with a medical backround speak of fruits, veggies and especially juicing. Yes, preventive medicine is the key. Starting in Medical School Doctors should be trained to be aware of the importance of an antiflammatory diet that Dr. Weil recommends. There is enough information available for people to make good choices instead of filling shopping carts with sugary snacks,juices that have added sugar, white flour bread, & lg portions of red meat. Eating lots of fresh fruits & veggies is the cornerstone to maintaing goood health. Thanks for the insights. Fortunately, medical schools are starting to adopt Integrative Medicine more frequently. UCSF has a great integrative division, as does Duke. Johns Hopkins recently opened a new one as well (I believe…) The future is bright! A marriage between modern and traditional medicine is essential. One can extract positive qualities from both schools of thought. FoundHealth is committed to this marriage! 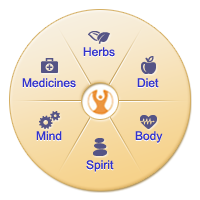 That is the premise behind our health wheel! Well explained,I believe Integrative medicine is a breakthrough in today’s health issues.It should be thoroughly promoted by combined forces of medical practitioners and professionals if they really care about good health,get the people’s awareness of it’s tremendous benefit. Hard to get really good healthy food with the planet so polluted!! I just wanted to mention the place of Chiropractors and Naturopaths in the scheme of natural integrative medicine. We shall not be dismissed or forgotten as a primary healthcare group of practitioners who have been practicing these concepts and giving advice to patients in this form for decades; long before it has become more popular and mainstream. As a matter of fact all chiropractors practicing in Massachusetts were put in jail for practicing “medicine without a license” up until 1969. Dr Hyman can we be more inclusive in mentioning two major professions that are part of this new paradigm ?? We are all trained professionals, and DC’s, and ND’s are rarely mentioned by integrative MD’s. We send you patients all the time, and our goal is to work with you as a team of natural healthcare. Sorry but Andy Weil cannot take all the credit for “inventing” integrative medicine. Amen Kate! Dr. Weil may have raised the Western world’s awareness to integrative medicine philosophy and practice, but I highly disagree than we can give him credit for its “discovery” when it has been practiced for hundreds (Naturopathic Physicians) if not thousands (i.e. Chinese medicine) of years. There are good and bad parts to all systems. This takes the approach of finding the good parts to all systems and integrating them into one system that is all good. It’s great to see so many people adopting this as a better way and helping to push it forward. We can guide our bodies to better health by understanding what foods contain and how they are produced. By routinely tweaking our eating and exercise habits, we build a healthier lifestyle. It may take a little extra effort, but it is great way to live and age, rather than accepting what is dished out. It’s just plain good old fashioned common sense! The good stuff! Great stuff!